It seems like more and more houses are popping up in the Kibagabaga area and on the hills beyond and, suddenly, this neighbourhood doesn’t seem as far as it once did. I remember when a trip to Caiman seemed like a trek to the mysterious edges of the Kigali world but now, with more and more businesses surfacing, I’ll trek out here without my usual ‘it’s too faaaaaar’ complaints. Happily, Kibagabaga has a bunch of great reasons to make the trip out here and Pili Pili has to be at the top of the list. Unfortunately for me, it’s about as far away as possible from where I live,. That might end up being a good thing though because I feel like, if it were closer, I’d hang out here way more than my bank account would approve because I’m a big fan of this place. I’m 51% sure that Pili Pili is owned and operated by the same guy who owns Bora Bora in Bujumbura. I visited that bar way back in 2010 and I remember a run experience in a place that was a bit different from the usual bars along the beach. It had great food, a pool, and a sort of party atmosphere while somehow managing to stay laid back and low key. I feel like Pili Pili has managed to pull off something very similar and I’m really excited to see a place like this open up in Kigali. I’ve always found the food and drinks here to be very good but I when went to Pili Pili the first time, I was a bit nervous about what to expect from the service. When they opened, I remember a few of their first visitors moaning on Facebook about disappointing service and food that took forever. But as far as I’ve seen so far, it seems that they’ve got that all under control and I’ve always found the service here to quick and friendly and I don’t have any complaints. And how about that food? Their hamburger and fries (Rwf 5,000) is a huge and is both good value and quite tasty. I think it’s one of the best burgers in Kigali. Their Gorgonzola pizza (Rwf 7,000) is another favourite and they don’t skimp on the cheese which is nice. 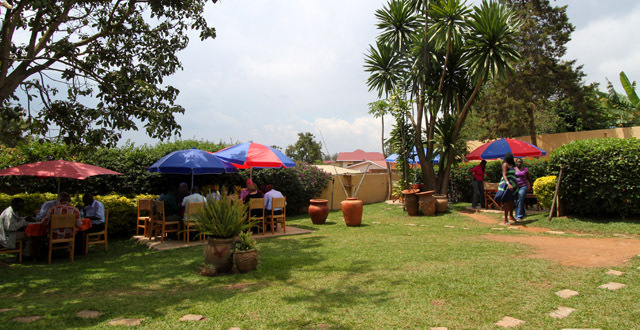 They do a variety of pizzas ranging in price from Rwf 6,000 to 8,000 and people seem to really like them. I managed to sample one of my friend’s fried calamari (Rwf 4,000) and really enjoyed it. Calamari isn’t something you see in Kigali often and I guess I always presume there’s a good reason for it. That whole being thousands of kilometres from the sea thing, perhaps? But I was impressed. They’ve actually got a bunch of unusual (for Kigali) fish dishes on offer including tuna steak (Rwf 10,000) which I’ve heard from a trusted source is very good. Being a little less adventurous with my food choices, I decided to stick with the good ol’ fish brochettes with chips (Rwf 7,000) and I was impressed yet again with thick, chunky fish morsels, crispy chips, and a generous helping of coleslaw. And, true to the restaurant’s name, Pili Pili has some very fine pili pili, indeed. They even offer an extra little touch with their presentation by serving it in a tiny bowl created from a half chili. As with all of their meals, it was a large helping and I though it was great value. Pili Pili also offer a nice little selection of desserts including crepes (Rwf 3,000), chocolate mousse (Rwf 3,000), and a variety of different ice cream sundaes (Rwf 4,000). I was pretty impressed with their Dame Noir sundae and they have a few others to choose from as well, including a tasty vanilla and speculoos option, if you’re not in the mood for a chocolate taste explosion, as I always am. Pili Pili have also gained a reputation as a good place to come for a cocktail. They make the closest thing I’ve found in Kigali to a legit mojito and they have a nice selection of other drinks. Throw in the amazing sunset and you have a perfect place for after-work sundowners. According to a flyer I found on the table, Pili Pili run a happy hour from Monday to Thursday between 5 and 7pm. They’ve got some pretty good deals with a half litre of draft beer for Rwf 1,000, a Heineken for Rwf 1,500, and glasses of red or white wine for Rwf 3,000. 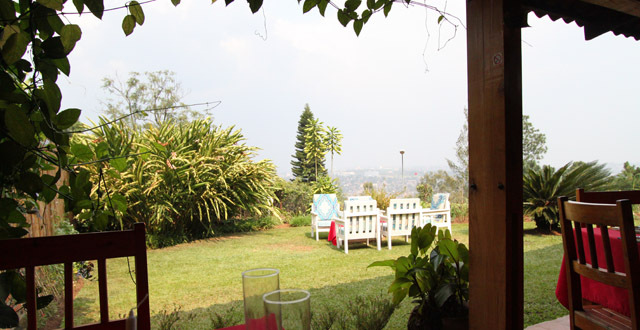 They also offer selected cocktails and pizzas for only Rwf 3,000. Even though the food and service are both really good, the best thing about Pili Pili (besides the zebra… of course that’s the best thing) is the view and the general atmosphere of the place. The building is unusual in that it’s made mostly of wood which, along with the pool, gives it a sort of beach house feel. Hang out on the couches down by the pool or head upstairs for a more creaky experience with an even better view, taking in what seems like a panoramic view of the entire city. It’s probably the best place in Kigali for a full view of the sunset in the giant sky. There’s also a little sandy section over to one side with so beach chairs and toys for the kiddies. If you’re not into screaming kids then perhaps choose your table wisely and avoid the one right next to the ‘beach’. Pili Pili manages to be a lot of things to a lot of people. There’s the kid’s area, a pool, a bar area, wifi, comfy spots to chill out in, corners to hide away in with your laptop, an amazing view, good food and drinks, it’s reasonably priced, they have a big screen for sports, and it’s all wrapped up into the package of an interesting building with nice service. I’m a fan! Check it out and let me know what you think in the comments below! Despiste is a nice place and the food is nice the customer service is horrible and yes: You can order your breakfast, go shopping, take breakfast somewhere else, go back to PiliPili and maybe your breakfast will be close to arrive. Also my suggestion is to ask for the bill when you arrive: Probably when you want to leave you will have it. I have eaten in many places in Kigali, and I found the food here to be very average and basic presentation, It needs more creativity its lacking. Variety of locally produced food should be more of the attraction here and cooked very well and served passionately.